The skin is prepared with Ultra Underbase and thinly concealed with Dermacolor Camouflage Creme 4 g where needed. To perfect the base Make-up Blend 30 ml is mixed with TV Paint Stick and Shimmering Event Foundation (pearl) creating a luminous complexion. HD Micro Foundation Cream 8.5 g naturally contours the face. As a base for the eye make-up, HD Cream Liner (aubergine) is blended over the eyelid and underneath the bottom lash line. 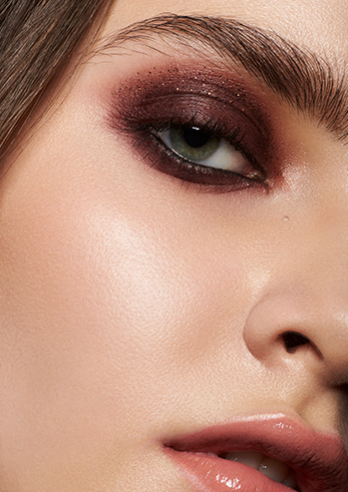 Eye Shadow Matt (SA 131), Eye Shadow Matt (RB 62), Eye Shadow Matt (red brown) & Eye Shadow Matt (aubergine) are blended over the HD Cream Liner creating a rich smokey eye. The almond shaped application is softened in the socket line with Eye Shadow Matt in ‘RB 62’. The brows are brushed up and left to lay natural and full. Eyebrow Powder (medium) and Eyebrow Powder (dark) softly fill in the brows. Eyebrow Forming Gel is applied to keep the brow hairs in place. Blusher is then applied using a blend of Lip N' Cheek (freesia) and Lip N' Cheek (hibiscus). This is massaged into the cheekbones with a higher concentration on the apples. Glamour Glow (rosy sensation) and Glamour Glow (moon dust) are used to highlight the skin while Glamour Glow (juicy moon) is swept over the cheekbones to illuminate the blusher. 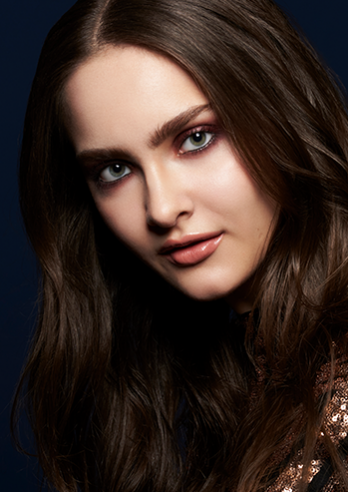 Glamour Glow in ‘Moon Dust’ is applied to the corners of the eye make-up and onto the cupid’s bow. Mascara Color Intensifier (black) is applied after the lashes are curled. HD Cream Liner (ebony) applied in the waterline intensifies the look. For the sparkling detail Polyester Glimmer fine (copper), Polyester Glimmer medium (copper), Polyester Glimmer fine (orange) and Polyester Glimmer medium (orange) are mixed together with Glamour Sparks (copper sparks). Before applying this dazzling mixture, Multi Gel 10 ml, clear is sparingly applied over the entire eyelid as base. The lips are lined using Faceliner (36). Once the shape is perfected it is then used to fill in the entire lip. High Gloss (toffee) is brushed on the lips creating a luxurious shine. To set the make-up, Dual Finish Palette 6 Colors (Cold Complexion) is used, in complementary tones, all over the skin to control shine and intensify the contour.